Watoto Child Care Ministries is a holistic organization that is dedicated to the plight of orphaned and vulnerable children and women; including former child soldiers and the war-torn community of northern Ugandan. Through practical and life-giving programs, Watoto is actively involved in bringing healing and life to all those affected by civil war, disease and poverty. Watoto was established in 1994 as a compassionate response to the AIDS crisis in Uganda and is now caring for more than 4,500 orphans and vulnerable women throughout Uganda, East Africa. Hundreds of people travel from the US to Uganda every year to volunteer with Watoto in various capacities including building projects, providing care and assistance in the Watoto babies’ homes, medical teams and many other support services. The Watoto Children’s Choirs have traveled the world since 1994 as ambassadors for the millions of children in Africa, orphaned as a result of HIV/AIDS, war and poverty. Beautiful Africa: A New Generation is the new choir production that debuted in the US in September 2011 and is traveling through the US in 2012. Their audiences have included the Queen of England, Presidents George Bush and Barrack Obama, many other dignitaries and the public at large. 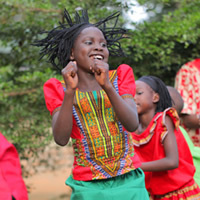 For more information about Watoto, go to www.watoto.com. Purchase Watoto music at their online store HERE.